PVC finds widespread use in above applications because of its low cost and desirable physical and mechanical properties. It is fabricated efficiently into a very wide range of both rigid and flexible products. It is also worth noticing here that inherently PVC is flame resistant. Substitutes for PVC materials are available, but often the alternative materials and processes are not as efficient or substitution costs are high, hence, PVC become the most widely consumed thermoplastic material. In view of the above mentioned qualities of PVC, Adam Jee Plastic Industries (Pvt) Ltd., a leading local manufacturer had started manufacturing of Solid\all PVC pipes in l986 and now has taken the lead again and started the production of Double-Wall Corrugated (DWC) PVC Pipes on Imported state of the art plant for the first time in Pakistan. Adam Jee’s PVC DWC Pipe System is used in an enormous variety of applications and competes with a diverse range of substitute materials. For example, DWC PVC pipe holds a commanding share in large diameter non pressure water and sanitary sewer pipe because of its low initial cost, ease of installation due to its remarkable low weight, long and reliable service life, and its low replacement and repair cost. WHAT MAKES IT A PREFERRED MATERIAL? Sanitary Sewers, Storm Sewers, Drains, Vent Piping, Duding and Conduit generally rely on gravity flow or do not operate under internal pressure. Their design is governed by external earth and traffic loadings. PVC DWC pipes provide an excellent combination of stiffness and strain capacity that have made DWC PVC pipe the preferred pipe for these applications. Adam Jee PVC DWC Pipe Systems offer many advantages that make double-wall pipe a practical and economical alternate to conventional solid-wall pipe. The OWC PVC pipe offers exceptional material savings of up to 50% as compared to conventional sold wall PVC pipes. Due to low weight per meter of PVC OWC pipe the production speed is relatively higher than the smooth sold wall PVC pipes. 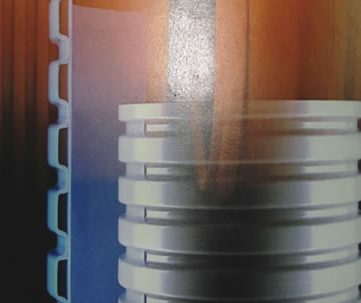 Light weight means that a pipe of the same diameter and the same ring stiffness can be produced with up to 50% less weight than a comparable smooth plastic pipe. The PVC structure of the DWC PVC pipe wall make such a saving possible. Due to lightweight DWC PVC pipe, particularly large sized pipe is easy to handle. For comparable pipe made steel, concrete and stoneware, head equipment is necessary at the construction site. However, DWC PVC pipe can nearly always be moved by hand or light equipment. 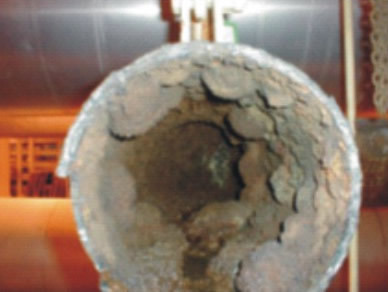 Waste water becomes mom and mom aggressive and attacking traditional pipe systems such as concrete pipes. 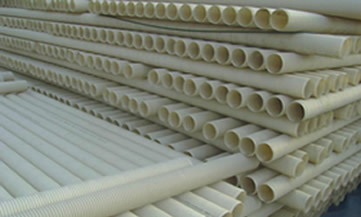 COW pipes made up of PVC offer a higher resistance to the aggressive substances. The PVC DWC pipe’s exterior structured wall (corrugation) which has the main share in ensuring very good mechanical performances and simultaneously lowering of the specific weight of the pipe. The PVC OWC pipe’s interior smooth wall ensures good hydraulic (flow) properties as compare to other competing material. A DWC PVC pipe has much higher ring stiffness than a smooth pipe with comparable weight per meter. PVC DWC pipe has high resistance to abrasion than most of the other piping materials. Besides high ring stiffness PVC DWC pipe has also optimal flexibility. That’s the advantage of the pipe when it is used as sewerage, storm water and drainage pipe. Concrete pipe often cracks as it is not flexible i.e…. it is not capable of compensating pressure by deformation or tectonic movements. Correctly designed DWC pipe made up of PVC resist a deformation rate of 30% which translates into an enormous advantage in regard to tectonics sudden overload. Concrete is the major substitute in this application, its cost per foot or meter of pipe may be comparable to DWC PVC pipe, installation costs are much higher, since many more pipe joints are required. Additional costs are imposed by the loss of water due to main breaks and pumping cost. Replacement and repair costs are much higher for concrete than for DWC PVC pipe as well. General: PVC DWC pipe is an ideal substitute product for concrete pipes has superior functional properties comparing with concrete pipe. Adam Jee has also plan to enhance the existing manufacturing facility of DWC PVC Pipe higher than 160 mm very men once its importance establishes into the local market of Pakistan. Adam Jee has also enhanced the capability of quality control lab, in which Quality Control Testing is routinely performed on samples, as DWC PVC pipes are manufactured, to ensure that proper production procedures and controls are consistently implemented as required to yield quality product which comply with specifications laid down by the relevant standard. As a double check Quality Assurance is also being done at the completion of manufacturing process and before delivering the product to the end users to ensure that properties and qualities evaluated in DWC PVC pipe consistently satisfying the requirements of applicable specifications. Polyvinyl Chloride Unplasticized (PVC-U) Double Wall corrugated (DWC) pipe is featured by two layers, inner smooth wall and outer corrugated. It allows a slight curving etc. Because of mirror-smooth inside surface, PVC DWC pipes have minimum flow head loss. There is also no build-up of inside deposits in PVC DWC pipes, a particular advantage in the construction of sewerage system. Because of rough inside surface huge flow head loss. There is build-up of inside deposits in other piping system, a particular disadvantage in reconstructions sewerage system.